In a previous post I talked about Teneo 2.0 and its JPA 2.0 and Hibernate 4.1 support. With these new developments it was time to upgrade the CDO Hibernate store also. So here it is: the CDO Hibernate Store in the CDO 4.1 release/build now also supports JPA 2.0 and Hibernate 4.1. This new functionality is available from CDO 4.1 RC1 or any nightly build from the 21th of May 2012. Hibernate 4.1 is a major release and it is not binary compatible with 3.6.0. This means that when getting the latest CDO Hibernate store 4.1 version you also need to upgrade Hibernate to 4.1, and if you are testing using hsqldb then make sure to also upgrade that one. Next to the work I am doing on an EMF JSON resource, and solving some bugs, I was very motivated to get a nice new feature into Texo: automatic code generation on model file changes. After each model change you have to go through the somewhat cumbersome right click on a project file and finding the Texo menu to generate your code. This has now become a lot easier! 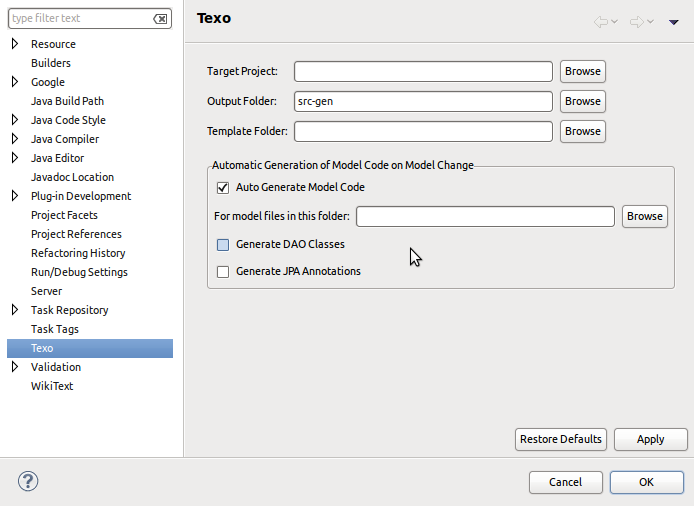 In the Texo project properties you can now define, that code should be automatically generated when a model file changes. This includes changes to xsd’s and annotation model files. The project properties allow you to set different things like if only certain model files should trigger a regenerate, or if JPA or DAO classes need to be generated. It is all described here. So just check the correct flag in the project properties and your code is generated on-the-fly and more importantly: automatic. After working on Texo JSON Rest, the next step for me has been to implement an EMF Resource which persists its data using JPA annotated entities in a standard ORM. This makes it possible to use Texo in a RCP environment with an EMF generated front-end and a Texo generated JPA backend. The first implementation of the TexoResource supports a 2-tier architecture: the JPA TexoResource communicates directly with the database through the JPA/ORM layer. My next step will be to implement a Texo JSON Resource which communicates using JSON with a server running Texo. The server side of this 3 tier architecture is already done: the Texo JSON web service layer. For an example project running Texo in Tomcat/web container check out this wiki page or see this video. For this new development I am developing EMF JSON converters, these could be useful also in other solutions, you can find the relevant plugin here in git. I am cooperating with others to develop an example RCP using Texo. My goal is to provide more example projects. If you are interested in cooperating on this, ping me on the Texo forum.